1. Harley 647 containing Cicero’s Aratea. Illustrated with the constellations. Hyginus’ commentary to the poem contained within the body of the constellations. Images: British Library. Aries (fol. 2v), Sagittarius (fol. 6r), Eridanus (fol. 10v). As to Julius Caesar we must no doubt make allowance. It was owing to his vast designs and all-absorbing activities that he accomplished less as an orator than his superhuman genius called for; just as in the case of Brutus we must leave him to his well-loved philosophy, for even his admirers admit that as an orator he did not rise to his reputation. You won’t tell me that anybody reads Caesar’s oration in defence of Decius the Samnite, or Brutus’s in defence of King Deiotarus, or any of the other speeches, all equally slow and equally flat—unless, indeed, it be someone who is an admirer also of their poetry. For they not only wrote poetry, but what is more they sent copies to the libraries. Their verse is no better than Cicero’s, but they have had more luck: it is not so notorious (quia illos fecisse pauciores sciunt). The eloquence and reputation of Demosthenes or Cicero is what boys keep on praying for throughout the spring holidays, every boy who goes to school accompanied by a house slave to guard his narrow satchel and who still worships thrifty Minerva with a single tiny coin. But it was because of their eloquence that both orators died. It was the abundant, overflowing gush of talent that sent both to their deaths. It was talent that had its hands and neck severed. The rostrum was never drenched in the blood of a feeble advocate. “O Rome, you are fortunate, born in my consulate” (o fortunatam natam me consule Romam). He could have laughed at Antony’s swords if everything he said had been like this. I rank his ridiculous verses above you, immortal Philippic, next to the first on the roll, with your distinguished reputation. And although he showed himself, as Plato thought a nature should do which was fond of learning and fond of wisdom, capable of welcoming all knowledge and incapable of slighting any kind of literature or training, he lent himself with somewhat greater ardour to the art of poetry. And a little poem which he wrote when a boy is still extant, called Pontius Glaucus, and composed in tetrameter verse. Moreover, as he grew older and applied himself with greater versatility to such accomplishments, he got the name of being not only the best orator, but also the best poet among the Romans. His fame for oratory abides to this day, although there have been great innovations in style; but his poetry, since many gifted poets have followed him, has altogether fallen into neglect and disrepute. best of all courtroom lawyers for your clients. Translation of Aratus’ Phaenomena (Aratea) 80s BCE (Prognostica added c. 60 BCE?) 480 lines in mss. ; c. 90 lines quoted by Cicero quoted by Cicero in De Nat. Deor. 2.104-114 (45 BCE); smaller self-quotations in other Ciceronian works. An epic on his consulship (De Consulatu) 60 BCE 78 lines quoted by Cicero in De Div. 1.17-22 (44 BCE). An epic on his own exile (De temporibus suis) 56-54 BCE lost references in Q.fr. 2.7.1 (Feb. 55 BCE), Q. fr. 3.1.24 (Sept. 54 BCE), Fam. 1.9.23 (Dec. 54 BCE). See Harrison 1990. An epic on Caesar’s expedition to Britain 54 BCE lost Q. fr. 3.7.6. An epic poem on Gaius Marius (Marius) uncertain date 13 lines quoted by Cicero in De Leg. 1.2 (after 52 BCE), Div. 1.106 (44 BCE). The whole truth, however, is in this verse, against which, I am told, the malicious and envious are wont to rail. Yield, ye arms, to the toga; to civic praises, ye laurels. (cedant arma togae, concedat laurea laudi). Not to mention other instances, did not arms yield to the toga, when I was at the helm of state? For never was the republic in more serious peril, never was peace more profound. Thus, as the result of my counsels and my vigilance, their weapons slipped suddenly from the hands of the most desperate traitors—dropped to the ground of their own accord! What achievement in war, then, was ever so great? What triumph can be compared with that? For I may boast to you, my son Marcus; for to you belong the inheritance of that glory of mine and the duty of imitating my deeds. And it was to me, too, that Gnaeus Pompey, a hero crowned with the honours of war, paid this tribute in the hearing of many, when he said that his third triumph would have been gained in vain, if he were not to have through my services to the state a place in which to celebrate it. Quintus. That oak lives indeed, my dear Atticus, and will live for ever; for it was planted by the imagination. No tree nourished by a farmer’s care can be so long–lived as one planted by a poet’s verses. Atticus. How is that, Quintus? What sort of planting is it that poets do? It seems to me that while praising your brother you are putting in a word for yourself as well. By day and night they circle with the sky. Around the pole the two constellations of the Bears course and never set. The other bears the name of Helice. Then the consul Marcus Tullius, either fearing his presence or carried away by indignation, delivered a brilliant speech of great service to the state, which he later wrote out and published [= First Catilinarian, Nov. 8th 63 BCE]. When he took his seat, Catiline, prepared as he was to deny everything, with downcast eyes and pleading accents began to beg the Fathers of the Senate not to believe any unfounded charge against him; he was sprung from such a family, he said, and had so ordered his life from youth up, that he had none save the best of prospects. They must not suppose that he, a patrician, who like his forefathers had rendered great service to the Roman people, would be benefited by the overthrow of the government, while its saviour was Marcus Tullius, a resident alien in the city of Rome [inquilinus ciuis urbis Romae]. When he would have added other insults, he was shouted down by the whole body, who called him traitor and assassin. 1 It is said of Helvia, the mother of Cicero, that she was well born and lived an honourable life; but of his father nothing can be learned that does not go to an extreme. For some say that he was born and reared in a fuller’s shop, while others trace the origin of his family to Tullus Attius, an illustrious king of the Volscians, who waged war upon the Romans with great ability. However, the first member of the family who was surnamed Cicero seems to have been worthy of note, and for that reason his posterity did not reject the surname, but were fond of it, although many made fun of it. For cicer is the Latin name for ‘chick-pea’, and this ancestor of Cicero, as it would seem, had a faint dent in the end of his nose like the cleft of a chick-pea, from which he acquired his surname. Cicero himself, however, whose Life I now write, when he first entered public life and stood for office and his friends thought he ought to drop or change the name, is said to have replied with spirit that he would strive to make the name of Cicero more illustrious than such names as Scaurus or Catulus. Moreover, when he was quaestor in Sicily and was dedicating to the gods a piece of silver plate, he had his first two names inscribed thereon, the Marcus and the Tullius, but instead of the third, by way of jest, he ordered the artificer to engrave a chick-pea in due sequence. This, then, is what is told about his name. 2 It is said that Cicero was born, without travail or pain on the part of his mother, on the third day of the new Calends, the day on which at the present time the magistrates offer sacrifices and prayers for the health of the emperor. It would seem also that a phantom appeared to his nurse and foretold that her charge would be a great blessing to all the Romans. And although these presages were thought to be mere dreams and idle fancies, he soon showed them to be true prophecy; for when he was of an age for taking lessons, his natural talent shone out clear and he won name and fame among the boys, so that their fathers used to visit the schools in order to see Cicero with their own eyes and observe the quickness and intelligence in his studies for which he was extolled, though the ruder ones among them were angry at their sons when they saw them walking with Cicero placed in their midst as a mark of honour. And although he showed himself, as Plato thought a nature should do which was fond of learning and fond of wisdom, capable of welcoming all knowledge and incapable of slighting any kind of literature or training, he lent himself with somewhat greater ardour to the art of poetry. And a little poem which he wrote when a boy is still extant, called Pontius Glaucus, and composed in tetrameter verse. Moreover, as he grew older and applied himself with greater versatility to such accomplishments, he got the name of being not only the best orator, but also the best poet among the Romans. His fame for oratory abides to this day, although there have been great innovations in style; but his poetry, since many gifted poets have followed him, has altogether fallen into neglect and disrepute. 3 After he had finished the studies of boyhood, he attended the lectures of Philon the Academic, whom, above all the other disciples of Cleitomachus, the Romans admired for his eloquence and loved for his character. At the same time he consorted with Mucius Scaevola, a statesman and leader of the senate, and was helped by him to an acquaintance with the law; and for a little while he also did military service under Sulla in the war against the Marsians. Then, seeing that the commonwealth was hurrying into factions, and from factions into unlimited monarchy, he betook himself to a retired and contemplative life, associated with Greek scholars, and pursued his studies, until Sulla got the mastery and the state appeared to be somewhat settled. The most lavish gifts bestowed on generals and valorous citizens were the largest area of land that a person could plough round in one day, and also a contribution from the whole people of one or two quarterns of emmer wheat a head. Moreover the earliest surnames were derived from agriculture: the name ‘Pilumnus’ belonged to the inventor of the ‘pestle’ for corn-mills, ‘Piso’ came from ‘pounding’ corn [piso = ‘mortar’], and again families were named Fabius [faba = ‘bean’] or Lentulus [lens = ‘lentil’] or Cicero [cicer = ‘chick-pea’] because someone was the best grower of some particular crop. One of the Junius family received the name of Bubulcus [bos, bovis = ‘ox’ or ‘cow’] because he was very good at managing oxen. Moreover among religious rites none was invested with more sanctity than that of Communion in Wheat, and newly married brides used to carry in their hands an offering of wheat. Atticus: As we have now had a sufficiently long walk, and you are about to begin a new part of the discussion, shall we not leave this place and go to the island in the Fibrenus (for I believe that is the name of the other river), and sit there while we finish the conversation? Marcus: By all means; for that island is a favourite haunt of mine for meditation, writing and reading. Atticus: Indeed I cannot get enough of this place, especially as I have come at this season of the year, and I scorn luxurious country-places, marble walks and panelled ceilings. Take those artificial streams which some of our friends call ‘Niles’ or ‘Euripi’—who, after seeing what we have before us, would not laugh at them? And so, just as you, a moment ago, in your discussion of law and justice, traced everything back to nature, in the same way nature is absolutely supreme in the things that men seek for the recreation and delight of the soul. I used to be surprised (for I had the idea that there was nothing in this vicinity except rocks and mountains, and both your speeches and poems encouraged me in that opinion) — I was surprised, I say, that you enjoyed this place so much; now, on the other hand, I wonder that you ever prefer to go elsewhere, when you leave Rome. Marcus: Indeed, whenever it is possible for me to be out of town for several days, especially at this time of the year, I do come to this lovely and healthful spot; it is rarely possible, however. But I suppose that the place gives me additional pleasure on account of a circumstance which cannot have the same effect on you. Atticus: What circumstance is that? Marcus: To tell you the truth, this is really my own fatherland, and that of my brother, for we are descended from a very ancient family of this district; here are our ancestral sacred rites and the origin of our race; here are many memorials of our forefathers. What more need I say? Over there you see our homestead as it is now—rebuilt and extended by my father’s care; for, as his health was not good, he spent most of his life in study here. It was on this very spot, I would have you know, that I was born, while my grandfather was alive and when the homestead, according to the old custom, was small, like that of Curius in the Sabine country. For this reason a lingering attachment for the place abides in my mind and heart, and causes me perhaps to feel a greater pleasure in it; and indeed, as you remember, that exceedingly wise man is said to have refused immortality that he might see Ithaca once more. 5. Richard Wilson, Cicero and his Two Friends, Atticus and Quintus, at his Villa at Arpinum. 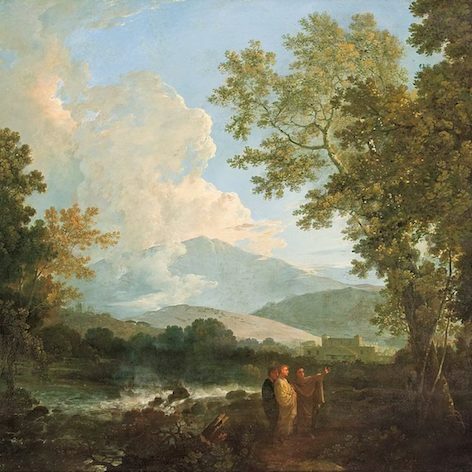 Appeared in the Royal Academy exhibition of 1770. According to David Solkin (1990: 42), Wilson based ‘Arpinum’ not on Italian topography, but on the Welsh countryside. Image: Wikimedia. 6b. D. Bernardo Clavelli, L’Antica Arpino (1623). Digitized by google books. 6c. Google map: Arpinum (modern Arpino). Basilica San Domenico Abate.